On Wednesday, Nov. 12, the European Space Agency made history by becoming the first to successfully land a probe, called the Philae lander, onto a comet. But things didn’t go as planned — the probe seems to have landed in a less-than-optimal position. At first, everything looked good: The Rosetta spacecraft carried Philae through space for ten years, successfully deployed it, taking images every hour as the adorable probe descended toward the comet’s surface. On first blush, Philae seemed to have landed in the exact spot that ESA scientists had aimed for and right on schedule as well.ESA mission control was ecstatic. 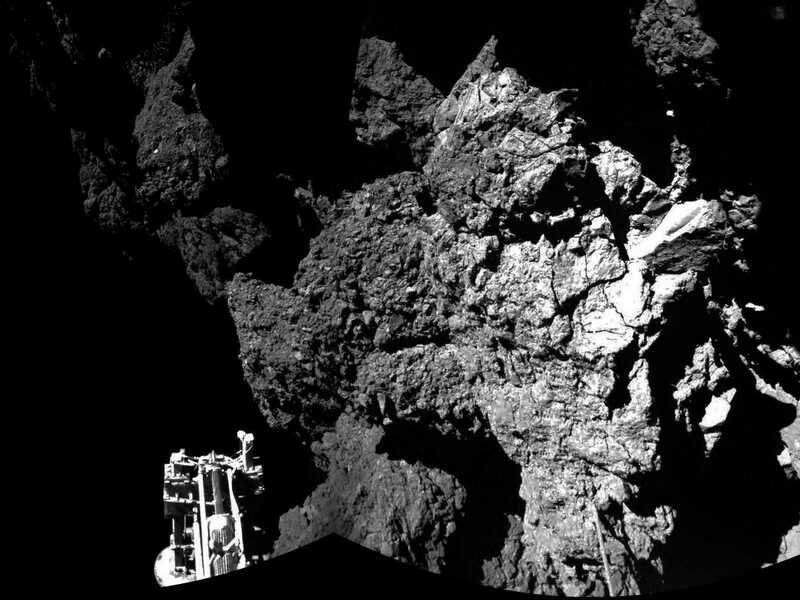 Here’s one of the first images that was beamed back — it’s just part of a full panoramic and you can see more pics from Philae here. But then they received data from the lander indicating that the probe seemed to have moved after landing. It seems to have hopped from where it was, because the harpoons meant to stick it in the comet hadn’t deployed. Since yesterday, the Philae team have determined that this rotation meant the lander bounced off of the surface of the comet where it had landed. It seems to have bounced not once but at least twice. The first bounce was a rough on the little lander, launching it about one kilometer above the surface — so far that took it nearly 2 hours to come back down to the comet. 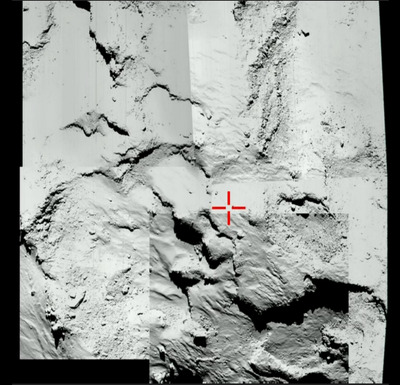 The second bounce was less severe but continued to move Philae further away from its intended touchdown point — shown below with a red cross. ESAThe landing point of Philae’s first touchdown point indicated by a red cross. 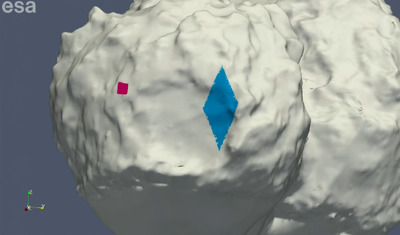 Since Philae seems to have bounced well off its target landing site, it is now somewhere scientists were not expecting. “This [bouncing] makes it difficult to find out where we are now,” said Stephan Ulamec, the Philae lander manager, in a briefing update ESA held on the morning of November 13. Here’s an image of where Philae first touched down on the comet (in red) and where they now suspect the lander is (in blue). ESAPhilae has bounced well off target. The blue region is large compared to the red because the scientists are still not certain exactly where Philae is. 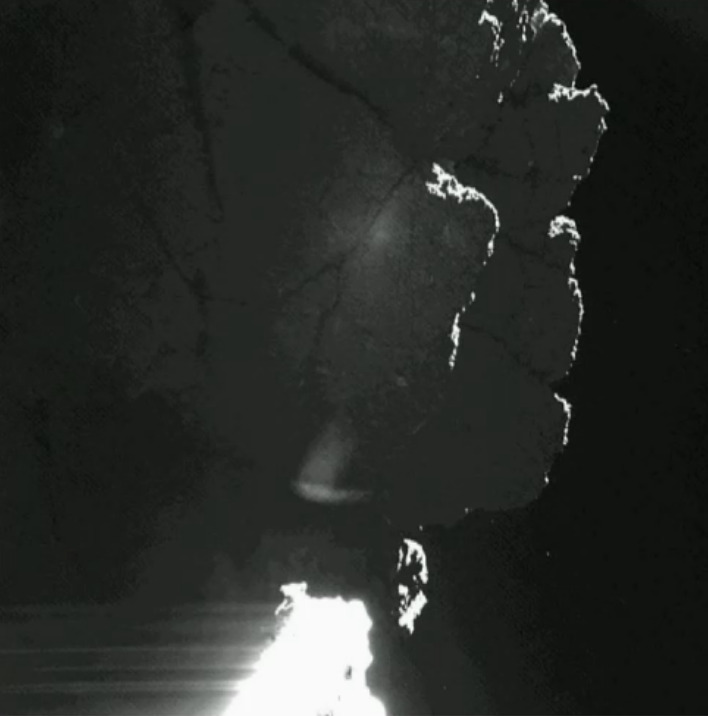 But from the latest images the lander is sending us, it looks like Philae has bounced itself into a shadowy corner of the comet, possibly underneath a large cliff. ESACliff located above the Philae lander. 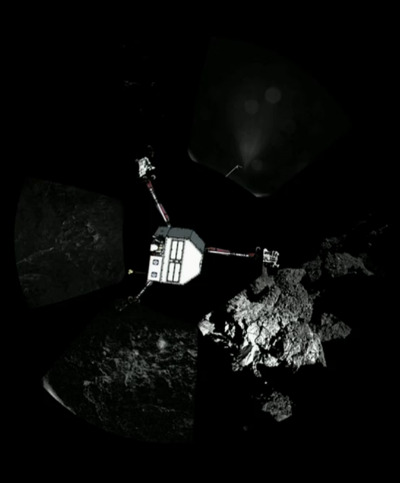 This is not good because Philae needs solar energy to power up. Right now, the lander is receiving only 1.5 hours of sunlight a day, compared to the 6 to 7 hours the scientists were hoping for. To make matters worse, it looks like Philae is not sitting upright on the surface, either. It’s not clear what orientation the lander is at right now, but scientists think it could be tipped to one side. This orientation is now the main focus of the Philae team because they must decide whether they want to attempt to manoeuvre the probe to get it into a better position. As it sits right now, it seems like some of the instruments of the lander cannot be used properly, including the drill to collect samples from the comet’s surface. Here’s an artists depiction of how the Philae might be oriented on the comet. It uses a real image of the comet taken by Philae in the background, and a fake image of the lander oriented in the way scientists suspect. ESAPhilae is not sitting upright. While solar energy would be great, Philae has about 2.5 days of battery life to collect the information scientists want without it. Some of the 10 instruments on board are already collecting data, even in this precarious position. The instrument called ROMAP, has already taken data on the magnetic field around the comet and scientists will be studying that data in the coming days and months. Despite the unideal landing spot and the wonky position in which Philae has come to rest, the scientists are still optimistic and proud of their success to touch a comet for the first time in history. And even if things aren’t looking good for Philae now, this might not be the last time we hear from her. When her batteries run out, Ulamec says, the probe can survive for a long time in “inactive” mode, and as seasons change on the comet it might get more sun, and therefore power up, at some random time and perk back up.